A recent Rasmussen survey found that two-thirds of Americans believe that their Constitutional right to keep and bear arms was intended to secure their freedom. A phone survey conducted on Jan. 16-17 asked 1,000 adults what our founders had in mind when they drafted the Second Amendment to the U.S. Constitution, 65 percent of respondents said that it was included to ensure that citizens could protect themselves from tyranny, 17 percent disagreed with that premise and 18 percent were not sure. 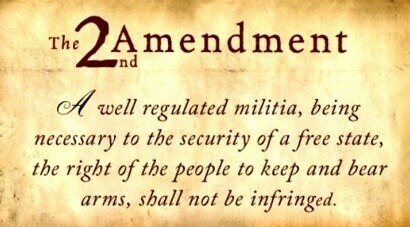 6* The Second Amendment to the Constitution provides Americans with the right to own a gun. Is the purpose of the Second Amendment to ensure that people are able to protect themselves from tyranny? When the data was analyzed to isolate for gun owners and non-gun owners, it found that 72 percent of gun owners regard the right to keep and bear arms as a protection against tyranny and 57 percent of non-gun owners who felt the same way. Along party lines, 75 percent of republicans, 54 percent of democrats and 68 percent of non-affiliated respondents believed that the Second Amendment is there to secure liberty and prevent tyranny. Obviously, how the public views the Second Amendment is critical to the national debate on gun control. Advocates for tougher gun laws are constantly seeking to frame the debate in terms of what’s optimal for hunting or sports shooting, as opposed to what’s best suited for defense against tyranny. One will recall New York Gov. Andrew Cuomo’s impassioned State of the State address a few weeks ago, where he declared, “No one hunts with an assault rifle,” adding that “No one needs 10 bullets to kill a deer,” (see video). When the Second Amendment is viewed in this light, as a right that is exclusively designed to protect hunters and sportsmen, it becomes much easier for the government to pass onerous gun laws, like the measures (seven-round magazines, police ‘assault weapon’ registry, etc.) that Cuomo rammed through the state Assembly and signed into law last week. This Rasmussen poll should serve as a reminder to gun owners that while the majority of people understand the purpose of the Second Amendment, there is still a significant minority that remains in the dark about this essential right. Again, as the survey illustrated, we’re not only talking about non-gun owning folks who are unclear about the meaning of our right to keep and bear arms, but gun owners as well – approximately 28 percent of a gun owners to be more exact. Beyond that, and as far as introductory teaching tools, I’d recommend two Guns.com interviews, one with UCLA Law Professor Eugene Volokh and another with Research Director of the Independence Institute David Kopel. Both men have a wealth of knowledge on our Second Amendment and how it has been interpreted by the courts over the years.